Do you ever feel that your skin is dull and lacking moisture? 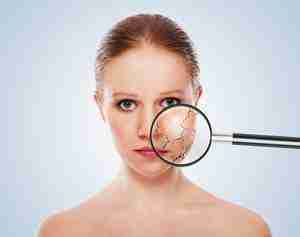 Or maybe you are getting older, and visible signs of premature ageing are becoming apparent. Your skin is clever, it has ingredients that regulate it to keep it healthy, and it even has its very own moisturiser, that regulates itself; it’s like a mini water maintenance provider system and its role is to keep your skin looking fabulously hydrated. Next to anti-ageing, finding the mechanism whereby the skin remains naturally moisturised, is the holy grail of skincare science. For many years cosmetic chemists were convinced, that there must be a chemical compound, that the body used to prevent our skin from becoming dehydrated. Finally they found an unusual substance and dubbed it the natural moisturising factor. Research found that a substance referred to as profilaggrin found in the epidermis, is broken down to filaggrin, an important component which helps regulate and keep our epidermis stable. As keratinocyte cells mature to the skins surface, the filaggrin appears to break down with protease enzymes. This creates the natural moisturising factor your skins mini hydration system, which regulates the water content and barrier repair which is ultimately what keeps your skin looking healthy. These are the components responsible for keeping your skin lovely and moist, attracting and binding water from the atmosphere and drawing it into the skins cells. Think hydration, hydration, hydration, perfect for all you dehydrated skin sufferers out there. Without getting to technical, these components form ionic interactions with keratin fibres, thus reducing the friction between the protein fibres, which increases the elasticity of our skin. It is this elasticity that makes your skin appear youthful and supple, it prevents your skin from drying out and cracking. Your natural skin moisturiser also corrects the balance of excess water influx, which causes our skins cells to shrink back. recognisable in the form of wrinkles. Think about how your skin looks and feels when you have been in the bath to long. When your skin is exposed to low humidity or harsh environments, the water content of your skin reduces. The naked chemist philosophy is all about replenishing skin identical ingredients that are missing, H20 pure hylauronic complex also contains urea, both of these ingredients are critically important, to keep your NMF naturally moisturised. Bio lipid complex is intelligently formulated to replenish missing lipids and repair your barrier, returning your skin to health. Once you understand the importance of the natural skin moisturiser, you begin to understand why a moisturiser is important for your skin. If you do suffer from any of the above conditions, it helps you to know what ingredients to look out for. All of these ingredients are hygroscopic and draw water to the skin from the atmosphere, helping to keep our skin tissues hydrated for longer. Want to know more about dehydrated skin but don’t quite know where to start? Then my article on the clear skin difference is the perfect platform to get you started. Your passion shines throughout the entire expanse of your shared knowledge.It is refreshing to encounter a soul dedicated to educating her potential clients to become better consumers. Bravo. You are head and shoulders above the greedy herd. Thanks so much for your comments, its really encouraging to know that people find the site a useful resource.